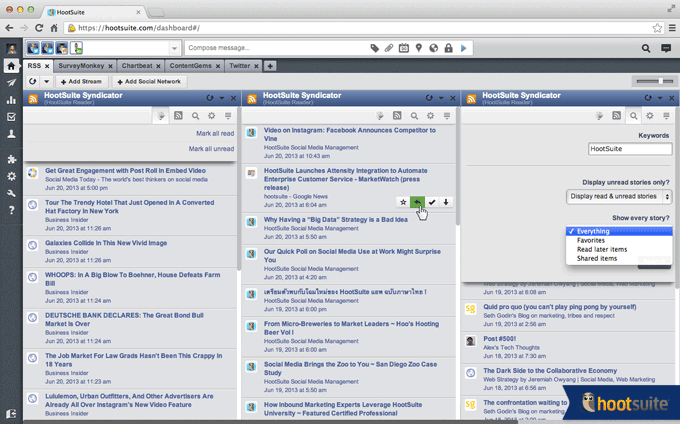 Hootsuite is one of the most user-friendly social media management systems. It’s an extremely handy tool, allowing you to manage multiple social networks in one screen, engage with your followers in each media profile, monitor your posts and analyse conversion rates. The most essential feature is the post scheduler. You can create your message posts with media attachment, with its own shortened hyperlink (ow.ly) and schedule them for later. Especially if your target audience is worldwide, there is no “best time to tweet”. Social media assistant tools’ ability to post over 24 hours is highly valued by any marketers. I think the Hootsuite’s success lies with its usability. It has such a clear indication of what you can do with each function. Easy to navigate and inviting, users find a great convenience in its interface, yet the access is limited if you stay free. Limited number of social media accounts may be one of the biggest reasons you may want to consider switching to Pro. Pro membership fee is $9.99 (UK: £6.99) per month. By the way Hootsuite also offers Business/Enterprise plan, allowing multiple users, social campaign templates, custom set-up, training and 24/7 priority support and so on. You can check the detail from here. Hootsuite free version allows you to create up to 3 profiles (e.g. Facebook, Twitter and Google Plus), whereas Hootsuite Pro version lets you have 50 profiles, plus 10 additional profiles for $10/£6.99 per month, up to maximum of 100 profiles. Most of us bloggers have more than three social media accounts. In addition to Facebook, Twitter and Google Plus, we have LinkedIn, Pinterest, Instagram, YouTube, Tumblr and so on. Especially those who promote variety of niches often have multiple profiles for each social media too. Three is such a small number. 50 is quite enough. Whether you think paying $9.99 per month is adequate or not, you’ll be tempted to upgrade your account to the Pro option. You have assistants/associates for your small business. You can monitor, analyse, publish or schedule posts as yourself to whichever the media, while one of your assistants can organise something else in another screen. You will have your control, therefore any posts that your assistant has created can be approved or rejected by you. You and your spouse have two separate businesses or blogs, with two separate social media accounts. It allows you to share the same interface working on different profiles and share the scheduler. If your business is shared by someone else, you’ll be capable of opening more number of social media accounts and co-managing them. I certainly could not engage with 50 social media on my own (I can’t even name 50!) So the additional member feature does make sense and I think it’s very reasonable. Whilst Free version only allows you to schedule your post one by one, with Pro version you can create and schedule up to 350 posts at a time using a CSV file. You type in Date & time, message and hyperlink in separate columns and upload the CSV file onto Hootsuite’s scheduler all at once. The great thing is that the link will automatically shortened to ow.ly. This is particularly useful as you can copy and paste the same link or message to multiple cells – although repeated posts with the same content can be filtered and frequently flagged as spam by social networks, and Hootsuite does warn you so. This is extremely time saving. The free version of Hootsuite only provides three basic overview analytics for Twitter, Facebook and Google+ respectively. Whereas with Pro, you can choose to have a few more customised reports displayed in your screen. It has a clever “point system”. A Pro user is given 50 points. Above examples are all Twitter analytics, generally require higher points (10-30) but with Facebook, Google+ and LinkedIn reports are mostly 5 points each. Facebook for example, you can have “Likes by Region” “Likes by Language” “Daily Page Activity” “Compare Public Pages” “Gender Summary” and so on, each one of which uses 5 points. So you can display quite a few detailed and customised charts in your reports screen. $50 per month! That’s quite extortionate, isn’t it. I take it that Hootsuite would dissuade you from buying extra points. You can’t manage more than 50-points worth of analytics, your screen will likely to be too crowded and disorganised. Unless you are a syndicated business, in which case better off with higher, the Enterprise option. 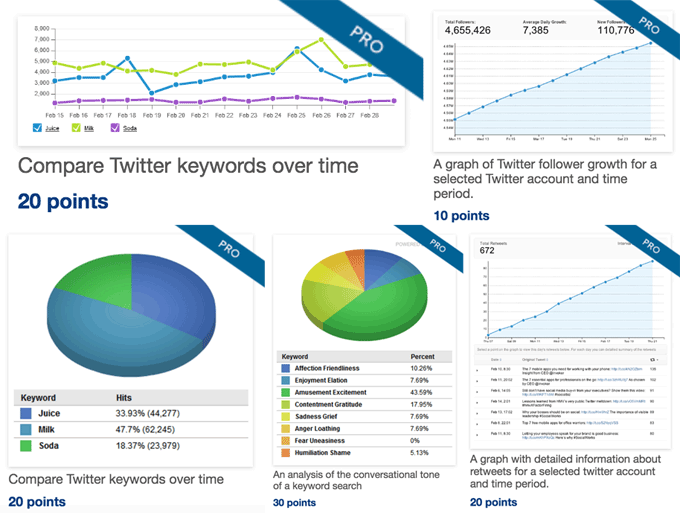 With the Free version you can still view the generic analytics reports at a glance (i.e. instead of logging into Twitter Analytics, Facebook Analytics and Google Analytics separately), so it is still convenient. But as you juggle between multiple media profiles, you want to study your followers and the conversion rates more in detail. So the Pro version’s analytic feature really is much more valuable. RSS feeds / Atom feeds are XML files generated by websites as a way to subscribe to new content on the site. Hootsuite can automatically post new content not just from your website, but from any other sites to your social networks. And how do you get an RSS reader? There is a free app that you can install into your Hootsuite dashboard (“Hootsuite Syndicator”). It will let you pull, read and share different articles, and track which stories you’ve shared. You can set up to 2 RSS feeds with Free version, and unlimited number with Pro. I personally see app integration feature for more techies, or in-deapth social media marketers. There are some popular networks such as Flickr, Xing, Flipboard, Reddit, SoundCloud, Vimeo and so on. With MailChimp app, you can monitor your email campaign within the Hootsuite platform, which can be convenient if you use MailChimp. YouTube app will cost you $4.99 per month, allowing you to schedule and bulk upload your YouTube videos from Hootsuite. That is only available for Pro users. But YouTube Analytics app is free to use. There are over 160 apps available, over 120 of which are free to download for both Free and Pro users. 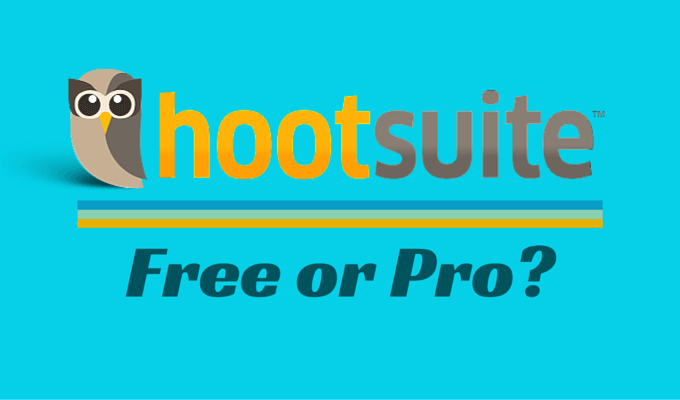 Hootsuite Free vs Pro – Should You Stay Free or Upgrade? Very good news is Hootsuite Pro version offers 30-days free trial. If you’ve never used Hootsuite, sign up now for free version. No credit card required at this point. I suggest that you give it a try with the big 3 networks (Facebook, Twitter and Google Plus) and see how you feel. When you feel comfortable – and you will soon be, I hope – switch to the Pro version free trial. Upon switching you’ll need your credit card. So once you’ve started the Pro module and you’re not sure, remember to cancel and downgrade it to the free account before the expiry.